It goes without saying that a large family is going to need a lot of food to keep it going. Sometimes it can seem overwhelming. Food prices continue to go up. It can feel like a losing battle, especially when you have many people in the house. 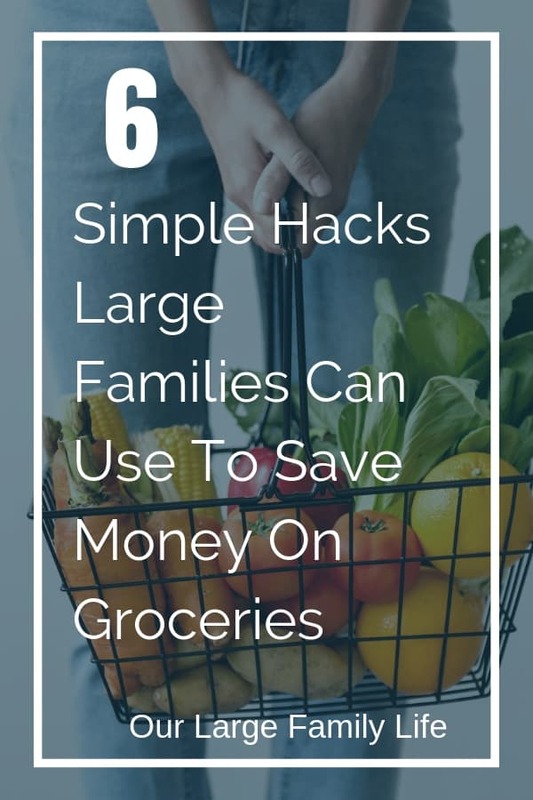 I’ve found though, of all the budget categories, the grocery budget is always the one that is most flexible and is the easiest place to trim. And if you are like me, you don’t want to sacrifice the quality of your food to save a couple bucks. We love real food, so finding ways to save means we still need to be able to buy real food. Here are some tips that I use to help control our food budget every month. The best way to save money on groceries is to not pay full price for them. Buying items that are on sale, marked down, or with a coupon is the best way to save money. This does require some work and planning beforehand, especially if you use coupons (I don’t). Around here all our new sales for the week start on Wednesday’s. I check to see what is on sale for grocery shopping on Friday. You can also ask your stores when they mark things, such as meat, down. This could be a great way to get meat cheaper and more of it. I know matching sales with coupons is a great way to save, so if that’s something you can do you totally should. We already don’t get the paper so I would have to get it for the coupon inserts. I found when we did do this, most of the coupons were for foods I don’t buy so it didn’t end up being worth it for us. When items you use are on sale if you have room in your budget, stock up. This is one of my favorite ways to save money and always have what I need in the house. Even if you can only buy a few extra it can make a difference. Meat is always a big one for us. Anytime chicken breasts are below $2.00/lb I always get extra because we eat a lot of chicken. Same with ground beef. We have a grocery store near us that will have 10lb tubes of 93% lean ground beef for 2.99/lb. ←-that’s an amazing price! So I buy the tube divide it up how I want, stick them in Ziploc bags and I have cheap meat stocked in my freezer ready to go. Sometimes I will even cook a bunch up at a time and then freeze. That makes it easier for cooking when I don’t have a lot of time. I remember in a consumer class in high school learning about price per unit and stuff like that when reading prices at the store. Who knew that would be necessary when having a large family? Here’s what this means. Bigger packages of things, like peanut butter or salad dressing, can actually cost less per pound or ounce when you buy the bigger package versus a smaller package. Now yes the bigger package will cost more because there is more, but you could actually be paying less over how much you’re actually going to use. Like it would be more expensive to buy two smaller packages than a bigger one (potentially). So start looking at price labels to see if you could save some money by buying bigger packages (only if you would actually use all of what’s in the package). Meal planning is one of the easiest ways to save money on groceries. It allows you to know exactly what you need to buy to use during the week (or however long your plan is). This cuts down on buying food that doesn’t contribute to any meal and ends up not being used or going bad. Meals plans also allow you to cut down on convenience food that is more expensive because you need something quick. I go in spurts with meal planning. Some weeks I’m really good at it and other weeks I’m at the store every couple days trying to figure out what we are going to eat. I definitely feel less stressed when I have a meal plan and know what’s going to be for dinner every night. For the longest time, I didn’t know what Aldi was. I had never seen or heard of one until I moved to Iowa and didn’t even know what the store was. A friend took me once and it was still years later before I actually started going myself. Now my primary store to shop at is Aldi. Aldi is a discount grocery store. They have their own brand of products, although sometimes they do have name brand stuff as well. Because of their business model they are able to offer lower priced groceries. This is another great way to save money on groceries. It’s like a store full of sale items. I am constantly amazed at how much food I leave with when I go. If you don’t have an Aldi in your area, see if there are other kinds of discount grocery stores. If you meal plan out far enough you could also just go to Aldi every two weeks or once a month if it’s farther away, then hopefully the trip would pay for itself. So maybe you aren’t into coupons, but there are a number of apps that can help you save money. Start by seeing if your grocery store has an app. One of our stores in town does and every week they have a super deal coupon to use. Since it’s on the app, they can just scan or punch in the number from my phone and I don’t have to worry about trying to track and find coupons. Checkout 51 and Ibotta allow you to earn cash back. You can also check out this post on grocery saving apps to find even more. Using the apps are a simple way to get some cash back and save money. Most likely you are already going to the store with your smartphone, so there won’t be a lot of extra work. 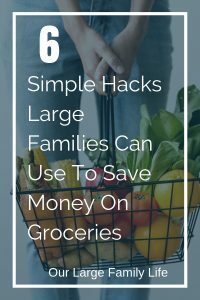 Saving money on groceries is definitely possible even when you have a large family. It can seem like we are always going to be spending a lot because we have to buy so much. While we will have to spend more than most, it doesn’t mean we can’t be smart about it and look for ways to save money. If you aren’t doing any of these things, start with one and get good at it. I would suggest meal planning as that will probably have the biggest effect right away. When you have that down, start moving on to the other tips. It will be totally overwhelming if you try them all at once. Start with one, make it a habit, and then add a new one to your grocery buying routine. Shopping sales and meal planning around sales, buying bigger packages, using apps and shopping at discount stores such as Aldi are great ways to help your budget when it comes to groceries. They may not all work for you, but find the ones that do and stick to them.